Biopolymers are the p0lymeric biomolecules which are produced by the living organism. Basically they contain large number of monomeric units that are covalently bonded and form big structure. Some biopolymers are biodegradable and can break down into carbon dioxide and water by microorganism. They are carbon neutral, sustainable and renewable because they are produced from plant. The Biopolymer market is expected to flourish at a significant CAGR during the forecast period of 2017-2027. Further, the market is expected to reach USD 5.5 Billion by the end of 2027.Rising demand for the sustainable and renewable polymer which emits less amount carbon dioxide anticipated to drive the growth of metallic stearates market. Further, the new favorable government regulations and policies are expected to expand the global biopolymer market. Further, North America is expected to contribute to the growth of the biopolymer market over the forecast period. It has several applications in such as packaging, bottles, automotive interior parts and others which is expected to showcase significant rise biopolymer market in the upcoming year. Asia Pacific is anticipated to witness robust growth in the global biopolymers market over the forecast period. The biopolymer market has been segmented into Calcium stearates, Zinc stearate, Magnesium stearates, and Aluminum stearates. Further, Calcium stearates accounted for the largest market share in overall metallic stearates market in 2016. Raw material for the production of biopolymer is obtained from the agriculture waste. It produces negligible amount of pollution as compared to other bio plastic polymer. Rising demand of the sustainable and renewable biopolymer in packaging and other industries is expected to garner the growth of the biopolymer market across the world. Further, changing government rules and policies for the use of plastic is anticipated to bolster the growth of the biopolymer market in the upcoming years. Biopolymers are the biodegradable polymer helps in reducing the carbon emission into the environment. It has large number of application in various sectors; growing focus of the manufacturer to enhancing the biopolymer properties by changing physical and chemical properties and various parameters is expected to drive the growth of the market over the forecast period. 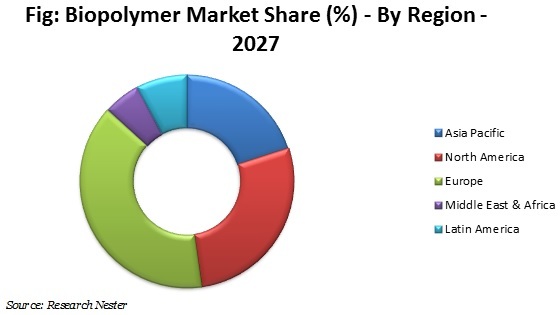 However, low chemical and mechanical resistance and high cost biopolymer product is expected to hamper the growth of the biopolymer market over the forecast period.